What’s better than a dashing duke? A dozen of them! 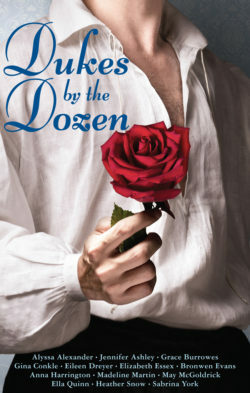 In this case, a baker’s dozen—thirteen top historical romance authors have come together to bring you more than a dozen tantalizing novellas, with one per month, for a year’s worth of never-before-released romances. The meticulous Duke of Ashford is dismayed when his children inform him they’ve asked the young widow next door to find Ash a new wife. Ash can’t think of a more appalling assistant than Helena Courtland, gossipy busybody he steadfastly avoids. But Helena sweeps into his home and his life before he can stop her, turning Ash’s precisely ordered world into a chaotic whirlwind.